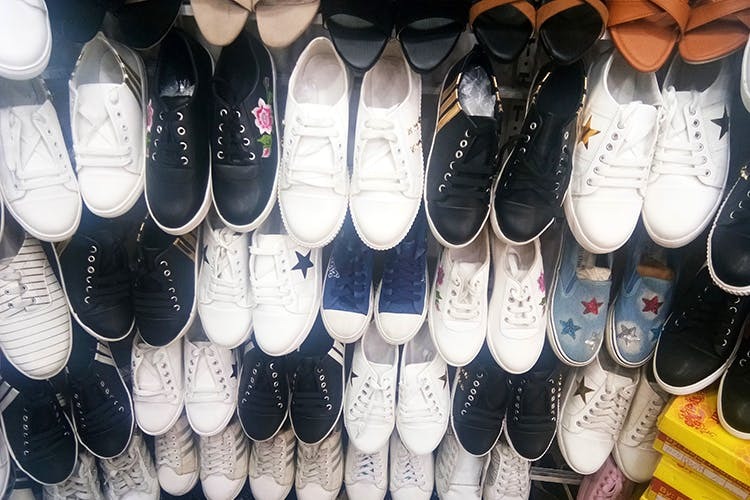 Stilettos that reach the sky, slip-ons with Aztec prints, and plain white and black sneakers that make a statement – they are all yours for a few hundreds at Brigade Footwear. Who said you can’t go budget shopping on Brigade road, for shoes? Bang in the middle of the city, Brigade Road offers plenty for the thrifty buyer. For those of you looking to give your shoe closet a major makeover minus the mega bucks, we point you in the direction of Brigade Footwear. A compact shop at the Brigade Road and Residency Road junction, Brigade Footwear brims over with trendy shoes that are great to team up with your casuals. As you enter, you’ll find the shop’s doors and overhead rafters lined with slip-ons, lace-ups, and ballerinas. The slip-ons especially come in fun styles with colourful Aztec prints or in shiny bronzes or blacks, or even with vibrant bead work. These begin at INR 250 so don’t feel shy about grabbing a few and making the most of them. Inside the store, we loved the range of black and white sneakers that are all the rage right now. You can grab the plain variety with just a thick heel. Or get the ones that feature motifs like stars or floral work. You can get these in blush pinks or in denims as well. For 550, we thought this was a great buy since even on Commercial Street you’ll spend at least a couple of hundreds more on these styles. They also have glitzy stilettoes with sky-high heels that we are not sure who can walk two steps in. Plus they are a bit over the top for our taste. But if you think you have the mastered the art, they retail for about INR 1,000. For those of you who prefer to walk on the ground, there are lace-up sandals and plain-jane slippers as well.